Rookie group A-PRINCE will be holding its solo concert “A-PRINCE Show – X-mas gift one day late” at Tokyo’s Sibuya public hall on December 26. According to A-PRINCE’s official Japanese site, www.a-prince.jp, on December 4, the five “princes”, of A-PRINCE, will take part in diverse program comprising songs, dances, talks,games and presentation of cherished possession. A-PRINCE, consisting of Songwon, Minhyuk, Seungjoon, Siyoon, and Woobin, released their debut mini album “Hello” last month. 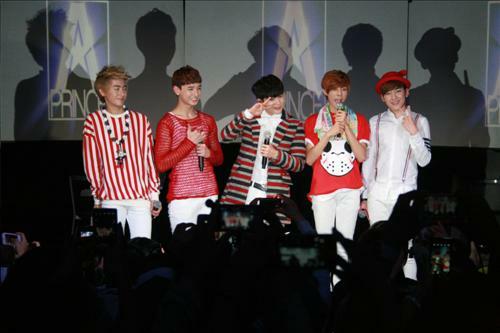 They held their first showcase in Tokyo, Japan on October 13.